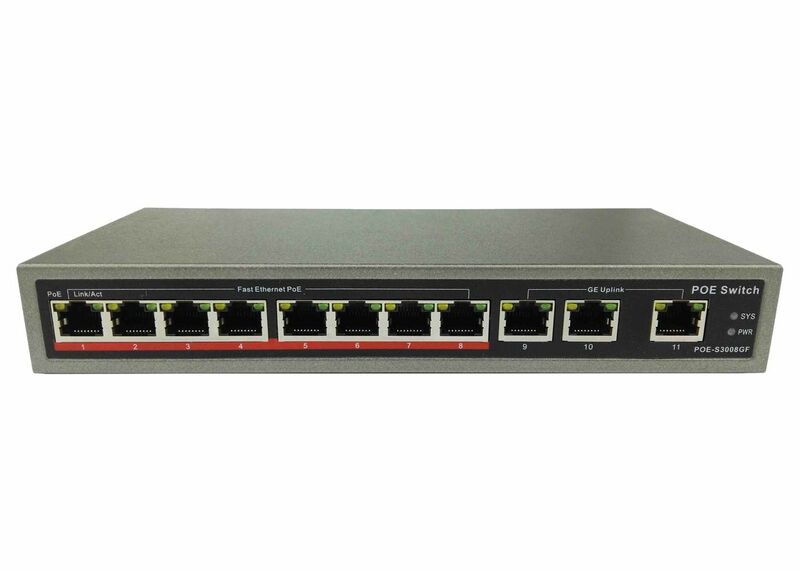 POE-S3008GF is 8 ports Fast Ethernet unmanaged Power over Ethernet switch with 3 port Gigabit RJ45 uplink, conform to IEEE802.3af/at and equipped with 120W external power supply, which enables it compatible with most devices like IP CCTV camera, Voice over Internet Protocol phone, Wireless Access Point and other associated powered device. Every single port supplies up to 30W maximum base on IEEE802.3at protocol and 120W power source, and the power will pass through pins 1,2 "+" and pins 3,6 "-" over Ethernet cable cat5, cat5e, cat6, cat6e, or others in higher quality standard, which mostly due to the power loss in the long transmission and the better the cable is used, the longer distance the power will deliver and it will make sure the best performance of those related equipment. Finally, There are also three kinds of practical system modes include free communication mode, VLAN port isolation mode and super remote transmission mode switchable among each other as required. 8 port 10/100Mbps POE + 3 port Gigabit uplink. Auto MDI/MDIX, Store-and-forward, 16G bandwidth. Max 30W for every single port, total rated output power 120W. 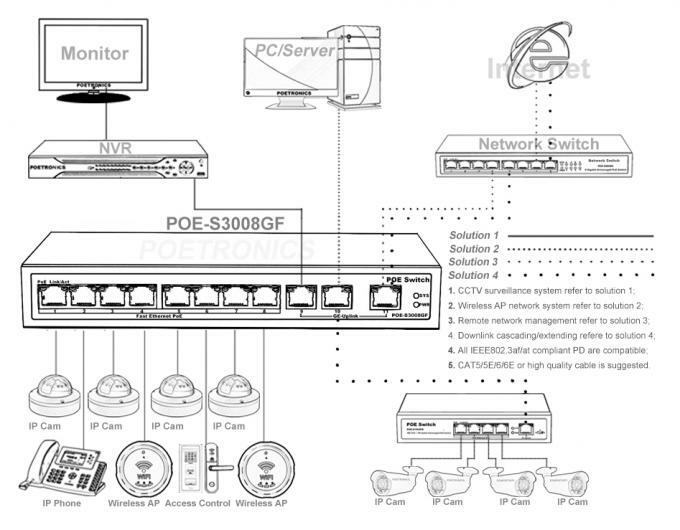 Switchable system modes: default free communication, VLAN port isolation and super remote transmission.